The story of the Vikings in Ireland is a fascinating part of their history, but one that is not as often told as their role in England, Iceland and the New World. Even Irish national histories minimize the effect of the Norse in their country. The Vikings deserve a great deal of credit for hastening the trend towards centralization and urbanization in Ireland. Unlike England, the Vikings in Ireland were never present in such numbers as to effectively colonize and conquer large swaths of the country. Instead, they built coastal settlements and focused on raiding and trading. From these bases in the late ninth century, the Vikings formed alliances and fought alongside one Irish kingdom against another. These alliances shifted but could be strengthened through inter-marriage. Most famously, in 999 AD the Irish High King Brian Boru was married to Gormflaith, an Irish princess who was the mother of Sigtrygg Silkbeard, the Norse king of Dublin, from her previous marriage to Olaf. Sigtrygg was then married to Slaine, one of Brian's daughters. These Hiberno-Norse (or alternately, Norse Gaels) faded from significance after the Battle of Clontarf in 1014, though Sigtrygg held on to Dublin until 1036. For SAGA, the Norse Gael faction is a mix of the Vikings and the Irish, leaning a bit towards the Irish. The Norse-Gaels are fairly "shooty." The Levy and the Warriors are both javelin throwers. Alternately, warriors and hearthguard can be armed with Dane Axes. They cannot be mounted as the Irish can, but on the whole, their defensive values are a bit better. Furthermore, their "gimmick" is the Challenge, in which significant combat bonuses can be achieved - if luck is on your side. From some of my many unassembled Wargames Factory sprues, I threw together a few dedicated Norse-Gaels. 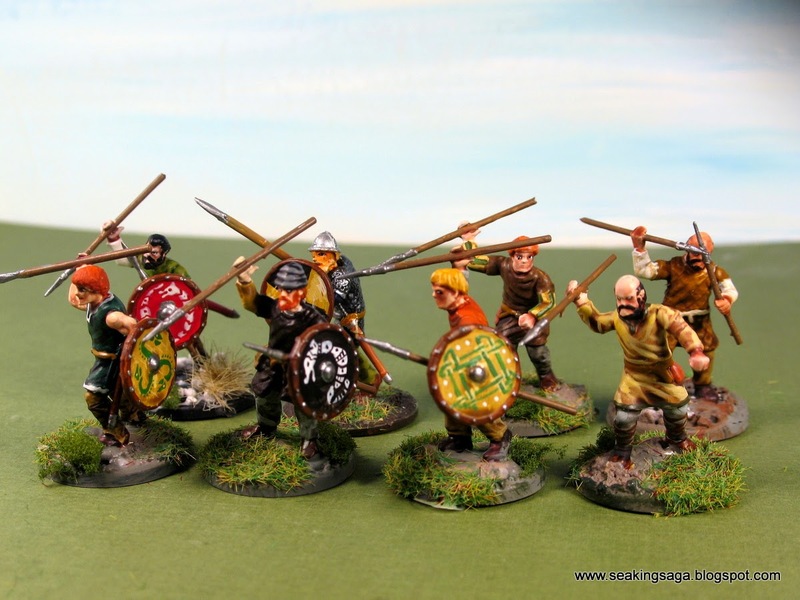 The first unit of warriors below is kit-bashed from several sets to achieve a mixed Viking-Irish look. Norse-Gael Warriors with double-handed axes below. The unit leader in front does not have a double handed axe, he has an axe in each hand. He was inspired by Floki from History Channel's Vikings - which is perhaps the only thing left worth watching on that channel. 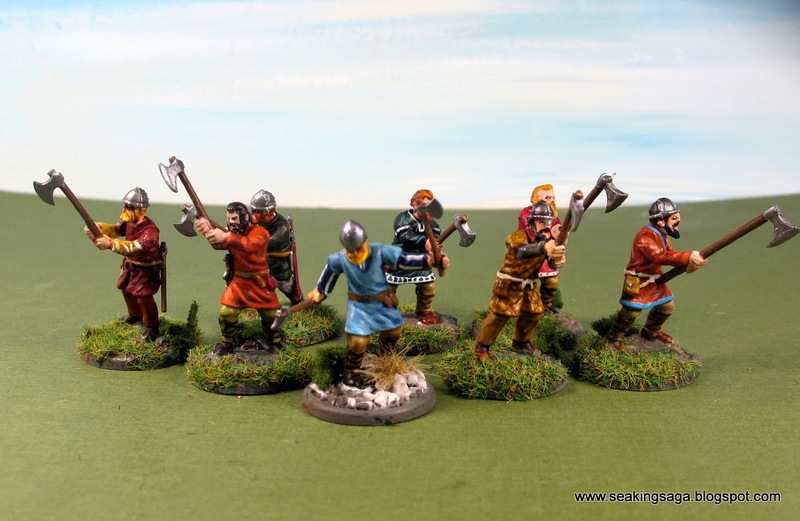 A six point Norse Gael warband below. If all goes well, this will be my army at my next tournament. The Irish have been my preferred SAGA warband lately for reasons of both game style and familial lineage. While most of my figures have been from Crusader Miniatures, I picked up an army pack of twenty from West Wind on a sale a few weeks age. 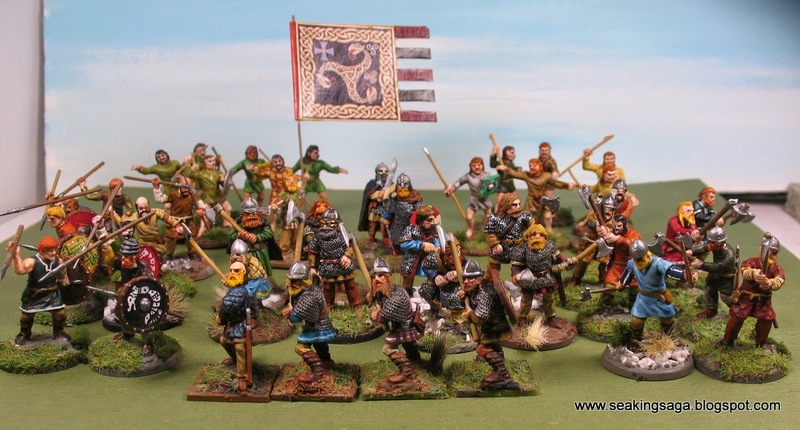 West Wind's Irish warband is, judging from the rest of their offerings, aimed at the early Dark Ages or Age of Arthur. Nonetheless, it is not too much of a stretch to use these for the era of Viking invasions in Ireland, especially in the ninth century. Below, a group shot of all twenty. For a paint scheme, I stuck with a limited palette. The shields were all red and white and I worked on plenty of variations of Celtic crosses, some historical and some improvised in that style. The rank troops are for spear or javelin (unsupplied) and come in four different poses. Hands will need to be drilled out in order to fit the weapon. Heads are separately cast, and there are 10 variations. Shields are separate as well (except for the musician). There are also four unique figures in the set. Two are warriors with short swords, which are cast-on and not separate. 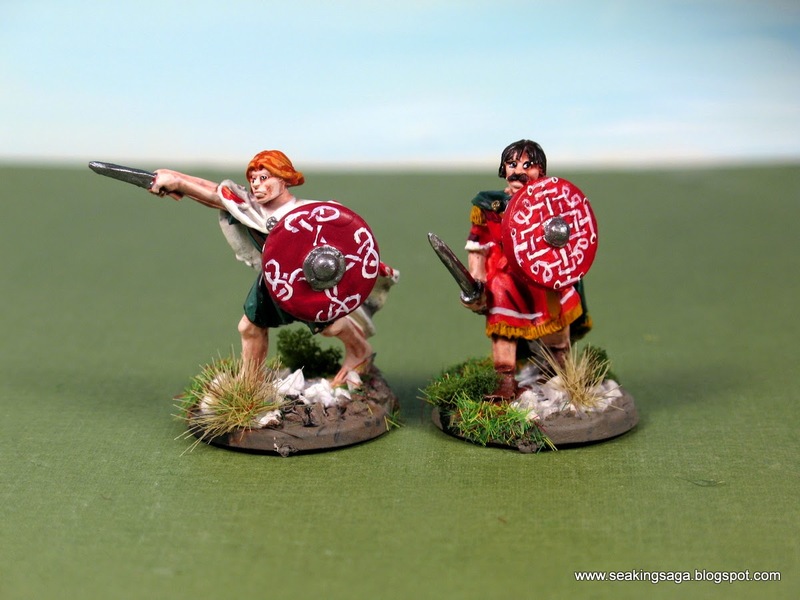 For a SAGA warband, these can serve as your Curaidh. 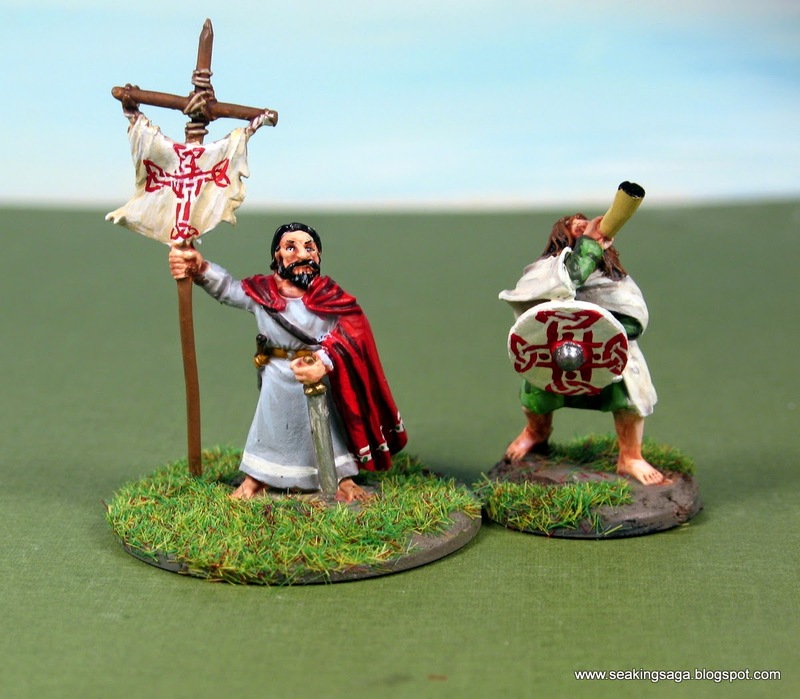 The other two unique figures are a command character with a banner and a musician. The rough and improvised banner is the detail that most distinctly places these figures in the pre-Viking age. Using a separate staff and Viking-era banner is easy, but the metal-cast banner is nicely sculpted and unique among my collection. I went with it. These are good figures but do require a bit of prep work. Drilling the spear holes is a plus for long term stability, but it is an extra task. Casting quality is good, but some cleanup of jagged areas is necessary. The neck pocket will also need to be opened up a bit on most of the figures in order to get the head to glue in properly. That is a small price to pay for having some customizeable options. 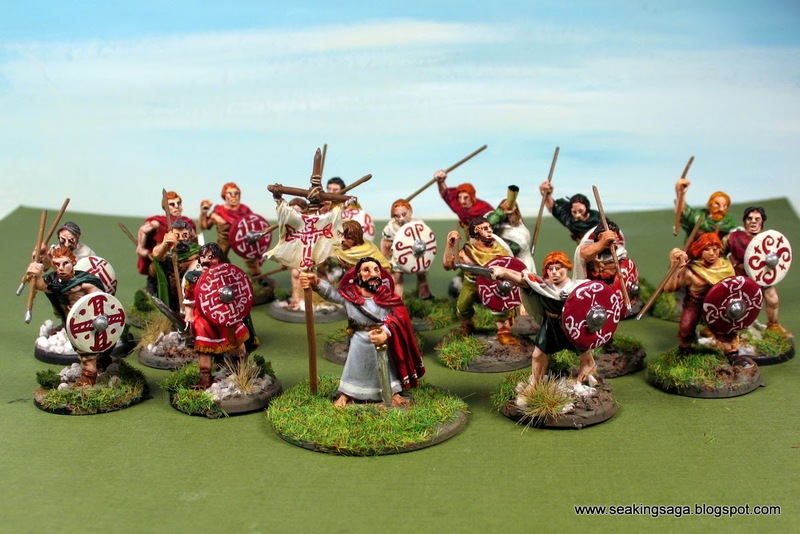 For SAGA, these twenty figures give you two points of warriors, a half a point of Hearthguard (Curaidhs) and a Warlord. One would need at least 12-20 more figures to get a complete six point warband out of this box, so this could best serve as an expansion to an existing army in that game.